Comments: This was not around very long.... That's Stan Ploski behind the wheel of the Norcia #81 Mustang body, with associate sponsorship from Finger's Auto Radiator (North Brunswick & Robbinsville, NJ, which also owned NAC - Nationwide Auto Cool, and Weber's TV & Appliance of Deans, NJ, and I think it said "George White Co. on the injector box. I've seen a lot of flips over the years and the two that stand out in my mind as the longest flips... 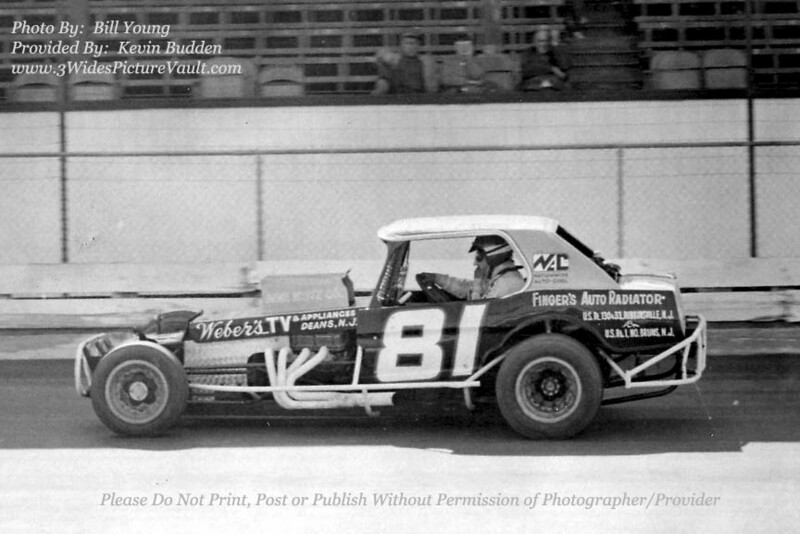 I'm talking about when the car just started rolling side over side and would not stop were Tommy Michel in a yellow #60 coupe down the backstretch at East Windsor... and the other would be Stan Ploski in the car pictured above, who flipped all the way down the backstretch during heat race action. Not sure how it started, but it began in turn 2 and didn't end until the car reached turn 3. Fortunately, due to the superior construction of the car, the cage held together and Stan emerged uninjured. Stan walked away from the ride that night as I'm told that he was unhappy with the way the car had performed up to that point, and I guess the flip was the "tipping point". 09.06.09 Walter Onora I remember that flip, like it happened yesterday. Stan flipped that section of the track, like the Norcia mount was a bowling ball!! One of the longest flips I have seen, especially at Flemington!